For the uninitiated, Jersey Boys is a jukebox musical that charts the formation, rise, and fall of the classic band The Four Seasons ending with their induction into the Rock and Roll Hall of Fame. I haven’t seen the stage musical but from my understanding of its structure, there doesn’t appear to have been much in the way of ‘adaptation’. The Broadway book writers Marshall Brickman and Rick Elice also did the screenplay and they even keep the super theatrical device of the characters talking directly to the camera/audience. That’s a stage staple rarely used in film for the reason that it's terrible. The theater has a different contract with the audience, one that is about shared space and willful suspension of disbelief for storytelling time. Film is a far more realistic medium. That’s especially true when a director eschews the fantastical, as Eastwood does for almost the entire running time, treating this as a conservative biopic rather than a true musical. Rather than populate the movie with name actors, Jersey Boys keeps the stage performers (from various productions). That’s a move I wish I could applaud since they all sing beautifully. Unfortunately most of them have nothing like true big screen presence (I believe this is what screen tests are for?) 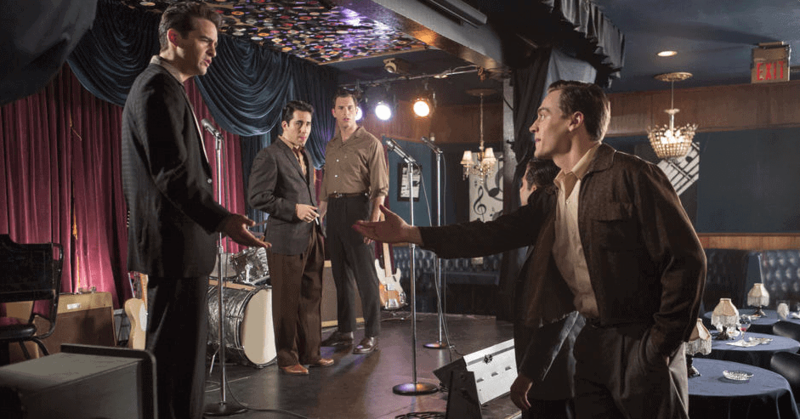 Erich Bergen is most promising among them as the straight laced songwriter Bob Gaudio. John Lloyd Young is especially problematic in the leading role despite his impressive pipes. He’s nearing 40 and less believable as a teenager (in the film’s first scenes) than any middle aged high schooler since Stockard Channing in Grease. It doesn’t help him that the washed out color palette often makes the actors look undead, as if their blood has been drained away before each scene. Was the key grip named Vlad? It's not supposed to be a horror movie even if it is a horror. Jersey Boys is so low on entertainment value and so short on color that you notice it every time it pops up — "ooh, an orange sign,” “yay, red jackets!”. Figurative color comes with about the same frequency and always feels like an oasis in the desert. The movie has hundreds of wide-eyed reaction shots from extras and principals alike that are variations on “wow this boy can saaaang!” awe. 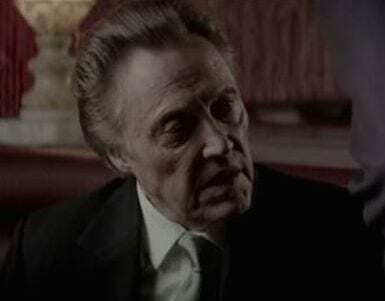 Christopher Walken, a joy as the gangster Gyp DeCarlo, is the only one that wins intentional laughs performing these. But Walken isn't in much of the movie and his dancing skills aren't even utilized. The other early blast of acting color comes from Renée Marino as Frankie’s future wife Mary. She’s a riot in her first big scene, a date with Frankie in which she totally takes charge. But then that actress disappears, replaced by her lifeless twin, blood drained from every subsequent scene once she’s been reduced to the stock character of Nagging Wife. My desperation for amusement became so great that I not only forgave but actively embraced the gay minstrel flamboyance of Mike Doyle as the producer Bob Crewe. I was all ‘get jt gurl’ every time he appeared when I might normally be cringing. In the end, Jersey Boys is little more than a feature version of an episode of Behind the Music. It even botches the simple stuff like a sad funeral scene with rough draft acting, awkward musical cues, and clumsy camera movement. Just when you think it can’t get any worse, the film jumps ahead to 1990 and Eastwood trots out the old age makeup on his thirtysomething castmembers. So soon after the prosthetic mummy horrors of J. Edgar? You can’t say Eastwood isn’t stubbornly committed to doing things the way he does them. Ah well, there’s always the music. The catchy glory of the familiar songs help. The corny bombast of Franki Valli’s late-career hit “Can’t Take My Eyes Off Of You” is undeniably pleasurable and a highlight. But no one will ever sing its hyper rousing 'I-iii love you, ba-aaa-by!' chorus to this movie.